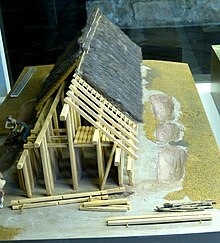 The long house was a rectangular structure, 5.5 to 7.0 m wide, of variable length, around 20 m up to 45 m. Outer walls were wattle-and-daub, sometimes alternating with split logs, with pitched, thatched roofs, supported by rows of poles, three across. The exterior walls would have been quite short beneath the large roof. They were solid and massive, oak posts being preferred. Clay for the daub was dug from pits near the house, which were then used for storage. Extra posts at one end may indicate a partial second story. Some Linear Pottery culture houses were occupied for as long as 30 years. Twenty or thirty people could have lived in each house, with villages composed typically of five to eight houses. Exceptionally, nearly 30 longhouses in a fortified settlement (dating to 4300 BC, i.e., Late Linear Pottery culture) were revealed by excavations at Oslonki in Poland. The Balbridie timber house in what is present day Aberdeenshire, Scotland offers an outstanding example of these early timber structures. Archaeological excavations have revealed extant timber postholes that delineate the support pieces of the original structure. This site is strategically located in a fertile agricultural area along the River Dee very close to an ancient strategic ford of the river and also near an ancient timber trackway known as the Elsick Mounth. Gimbutas, Marija (1991). The Civilization of the Goddess: The World of Old Europe. San Francisco: HarperCollins Publishers (HarperSanFrancisco). ISBN 0-06-250368-5. Marciniak, Arkadiusz (2005). Placing Animals in the Neolithic: Social Zooarchaeology of Prehistoric Farming Communities. Routledge Cavendish. ISBN 1-84472-092-6. ^ The numbers are from Gimbutas (1991) pages 39–41. However, they are approximately the same as the numbers given by other researchers and can therefore be taken as true measurements within a tolerance. ^ a b Marciniak, Chapter 1. ^ "Archaeological Research at Oslonki, Poland". Princeton.edu. Retrieved 2013-04-23. ^ "Linearbandkeramik Culture - The First Farmers of Europe". Archaeology.about.com. 2013-01-17. Retrieved 2013-04-23.